North Korea launched a rocket from the Sohae Satellite Launch Center at 0031 UTC on Sunday. First indications are that the launch was successful, with the first and second stages of the rocket and the satellite fairing falling into the broad areas of the sea they were expected. Following the launch from the Sohae Satellite Launch Center, the first stage fell to earth at 0037 UTC, the fairing at 0037 UTC in the East China Sea and the second stage at 0045 UTC in the Pacific Ocean. Whether the rocket successfully released a satellite won’t be known for several hours. First word is expected to come from U.S. Strategic Command, which tracks objects in space. 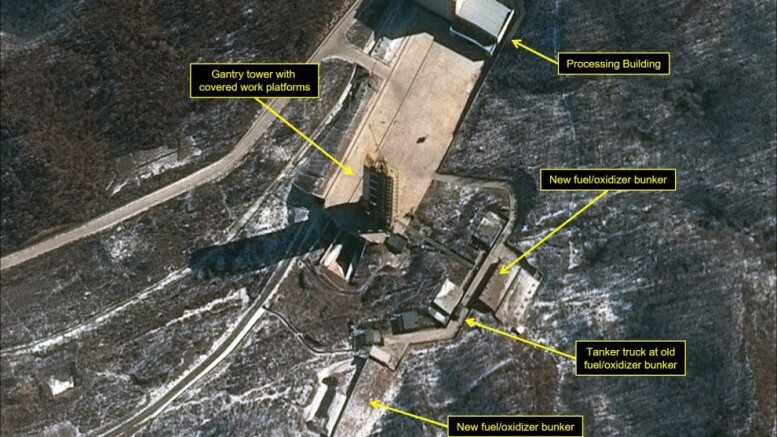 The launch had originally been scheduled for sometime between Feb. 8th and 25th, but North Korea on Saturday said it would launch the rocket between Feb. 7th and 14th. The date is thought to have been chosen for the fine weather over the launch area and a desire to conduct the launch before two upcoming holidays that honor Kim Jong Il. North Korea’s neighbors had urged the country to call off the launch. In comments to reporters just after the launch, Japanese Prime Minister Shinzo Abe said it was a violation of United Nations Security Council resolutions.